Just because Aqovd.com looks like a reliable search engine, it does not mean you have a reason to trust it. The ugly truth is that Aqovd.com is a browser hijacker that enters your computer when you download and install freeware applications. You should not tolerate this program because it modifies your browser settings without your permission. The sooner you remove Aqovd.com from your system, the better. There is no saying what could happen if this browser hijacker gets exploited by cyber criminals. Thus, you need to stop this from happening in the earliest stages of a malware infection. The reason users may consider Aqovd.com a reliable search engine is that this browser hijacker really provides you with an actual search service. What’s more, it also offers you shortcuts to the most frequently visited websites, related to videos, games, and shopping. However, all these links up there added in order to help the people behind Aqovd.com generate financial profit. Each time you increase the traffic count for an affiliated website, the Aqovd.com developers get paid through the pay-per-click system. Although this kind of practice is not illegal, there is nothing in it for you. Not to mention that a browser hijacker is a dangerous infection in the first place, so you should not wait any longer. If you do not remove Aqovd.com from your system, you can be sure that sooner, rather than later, you will be redirected to unreliable websites that are related to malware distribution networks. We are not trying to say that Aqovd.com wants to infect you with malware on purpose. The problem is that browser hijackers can be easily exploited by cyber criminals to distribute corrupted content or collect information on your browsing history. In fact, Aqovd.com gathers such information automatically, once it gets installed on your PC. Browser hijackers employ tracking cookies to keep tabs on your web browsing habits. This is definitely an alarming practice, so you have yet another reason to delete Aqovd.com at once! 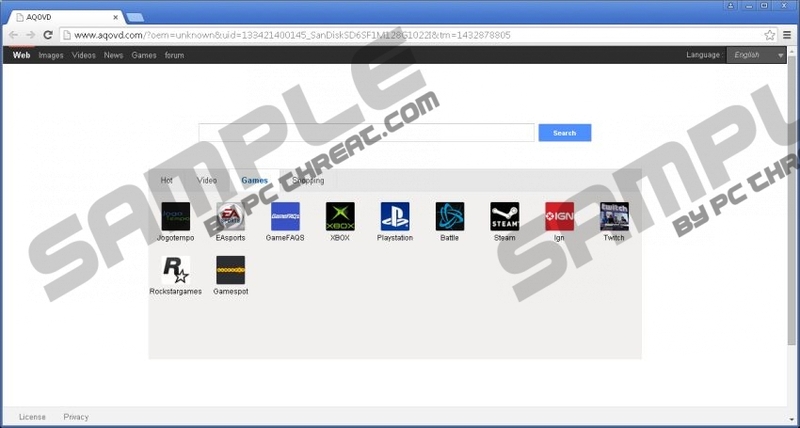 As far as the hijacker’s origins are concerned, Aqovd.com is created by the same team of developers as Top8844.com, gamegogle.com, jogostempo.com, and 123rede.com hijackers. The installer file for this infection is signed by Beijing Gaojiaoxintu Technology Co., but it does not mean that this is the name of the developing company. For all it’s worth, the digital signature might be fake as well. This just shows that Aqovd.com belongs to a group of notorious infections that should be terminated as soon as possible. There is also a good chance that you have several other unwanted applications on your computer because Aqovd.com cannot be distributed directly. To detect and remove all the potential threats, you should scan your system with a reliable antispyware tool. We also provide instructions below on how to restore your browser settings, but we would like to point out that it may not be enough to protect your PC from harm. The best way to ensure your system’s security is to acquire a computer security application of your choice. Go down to the bottom and click Show advanced settings. Quick & tested solution for Aqovd.com removal.